Nutcracker syndrome is caused by compression of the left renal vein between the aorta and the superior mesenteric artery where it passes in the fork formed at the bifurcation of these arteries. The phenomenon results in left renal venous hypertension. The syndrome is manifested by left flank and abdominal pain, with or without unilateral haematuria. Other common presentation is as ‘pelvic congestion syndrome’ characterized by symptoms of dysmenorrhea, dyspareunia, post-coital ache, lower abdominal pain, dysuria, pelvic, vulvar, gluteal or thigh varices and emotional disturbances. Likewise compression of the left renal vein can cause left renal-to-gonadal vein reflux resulting in lower limb varices and varicoceles in males. Its diagnosis is based on history and physical examination, basic lab tests to exclude other causes of haematuria, cystoscopy and ureteroscopy to confirm unilateral haematuria and exclude other causes of this sinister symptom. Sequence of imaging has more or less been rationalised to USS with Doppler studies, CT or MR angiography and finally phlebography with renal vein and IVC manometery to confirm the diagnosis. Review of the reported cases suggests that this condition is relatively more common in women. Most cases present in the 3rd or 4th decades of their lives although few patients have presented in adolescence and others in later years. Observation has been made that many sufferers are of above average height and tend to have an asthenic built.6Buschi et al. having observed distended left renal vein on CT and sonography in 72% of patients undergoing these examination hypothesised that asymtomatic mesoaortic compression of the left renal vein is quite prevalent. 11 However, the exact incidence of the symptomatic nutcracker syndrome is not known. Most cases in the literature have been reported from the Far-East. The sequence of diagnostic tests, however, should depend on the mode of presentation. Patients presenting with classical symptoms of flank pain and unilateral haematuria would require investigations directed to establish the cause of haematuria. The diagnosis of vascular malformation usually comes to light as a clinical surprise. On the contrary patients with no haematuria or non-urological manifestations will require tests specifically targeted to diagnose the vascular anomaly. We present an algorithm for the sequence of diagnostic tests depending on the mode of presentation. Magnetic resonance angiography offers the advantage of multi-planer imaging in transverse, coronal and sagital planes of the body thus, allowing an excellent anatomical definition. MRA also has the added advantage of being radiation free. Abnormalities noted on MR angiography in cases of NCS include dorso-lateral torsion of the left kidney, abnormally high course of the left renal vein, abnormally low or lateral origin of SMA, and abnormal configuration of origin of SMA. Thus, MR angiography provides a non-invasive radiation free alternative to CT angiography in the diagnostic work up of this patient population. In an interesting study, Andrianne et al. reported 22 an intra-operative technique of confirming the diagnosis of NCS associated with gross haematuria. They demonstrated that clamping of the renal vein is followed by the immediate appearance of massive and reversible haematuria. Authors also suggested that a pre-operative percutaneous haematuria provocation test can be performed during venography by temporarily obstructing the left renal vein. This would allow formal diagnosis of this syndrome when the condition is highly suspected. Management of the renal nutcracker syndrome has been evolving over the last four decades. The available options can be sub-classified into four groups (Table 1). Intra- or extra vascular stents. Aim of this procedure was to correct posterior ptosis, (assumed to be the cause of NCS) and excise the varices, which were deemed to be the consequence of renal mal-positioning. However, simple nephropexy with excision of varicosities is no more recommended as it fails to address the primary pathology. Other open surgical procedures employed included left renal vein transposition, transposition of the superior mesenteric artery, renal auto-transplantation and gonado-caval bypass. Vessel transpositions although successful entail major surgical procedures, are associated with risks of bleeding, thrombosis and paralytic ileus. Consequences of superior mesenteric arterial thrombosis would be devastatoing. Gonado-caval bypass has been employed in patients with NCS associated with pelvic varices but has not gained wide popularity.14 Renal vein transposition and auto-transplantation have been associated with good outcomes and relatively less morbidity while SMA transposition has fallen into disfavour because of higher post-operative complication rate. Zhang et al. 8 compared the outcomes of three patients who underwent transposition of SMA to three who underwent endograft stent (Wallstent) placement into LRV under digital subtraction angiography (DSA). Follow up ranged from 4 to 54 months. All patients were free of symptoms of loin pain, haematuria and dizziness. Pre-operatively noted proteinuria also resolved in all cases. Although endovascular stenting is a simple and attractive option its future role in the management of this condition remains to be established. Stents in the venous system can cause fibromuscular hyperplasia, which may result in venous occlusion. Another possible complication is proximal migration or embolization. Thus, we should await the long-term outcomes before deciding on the place of endovascular stents in the management of nutcracker syndrome (Table 1). From the number of cases reported in the world literature it is obvious that this condition is not very common. Its classical manifestations include loin pain, unilateral micro or macoscopic haematuria with pelvic or genital varices. Its diagnosis is based on history and physical examination, basic lab tests to exclude other causes of haematuria, cystoscopy and ureteroscopy to confirm unilateral haematuria and exclude other causes of this sinister symptom. 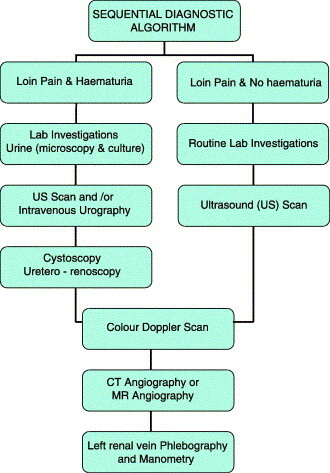 Sequence of imaging has more or less been rationalised to USS with Doppler studies, CT or MR angiography and finally phlebography with renal vein and IVC manometery to confirm the diagnosis. Surveillance is appropriate in cases of mild symptoms and either microscopic or insignificant macroscopic haematuria with no evidence of significant blood loss. Open surgical interventions although effective are associated with higher surgical morbidity. The alternative option of intra-vascular or laparoscopic application of extravascular stents is very appealing because of the minimal invasive nature of the procedures. If the long term outcomes remain as good as the short term results reported so far then stenting (extra-vascular/intra-vascular) may become the treatment of choice in this syndrome. M. Hohenfellner, F. Steinbach, D. Schultz-Lampel, et al. H.K. Zhang, L.G. Shen, M. Li, et al. T. Takemura, H. Iwasa, S. Yamamoto, K. Fukushima, S. Isokawa, M. Okada, et al. H. Zhang, N. Zhang, M. LI, W. Jin, S. Pan, Z. Wang, et al. Y.B. Park, S.H. Lim, J.H. Ahn, E. Kang, S.C. Myung, H.J. Shim, et al. N. Segawa, H. Azuma, Y. Iwamoto, T. Sakamoto, T. Suzuki, K. Yamamoto, et al. N. Segawa, Y. Katsuoka, et al. T. Oteki, S. nagase, A. hirayama, Sugimoto, A. Koyama, et al. L. Van der laan, J.A. Vos, F.L. Moll, et al. Y. Hosotani, H. Kiyomoto, M. Kohno, et al. W.Q. Lin, H.F. Huang, M. li, J.Q. Zhou, et al. Corresponding author. Dr M.S. Khan, MBBS, FRCS (Urol), FEBU, Department of Urology, First Floor Thomas Guy’s House, Guy’s Hospital, London SE1 9RT, UK. Copyright © 2005 Elsevier Ltd. All rights reserved.